I began building a SeaRey in June, 2000, and am finally getting it close to flying--so it was time to get some flight training at the SeaRey factory, Progressive Aerodyne, in Orlando. This is a collection of email messages I sent to relatives using my Palm pilot The Palm screen is small, and I've done only minimal editing, so don't expect a masterpiece. The drive down here was... a long drive, and I suffered from motelitis last night and this morning. But then it was time to go fly a SeaRey, and at that moment, the sky cleared, the sun shone, the water parted, the--oh, no, not the water part. The water stayed right where it was. I drove to the Progressive Aerodyne factory, timing it to arrive at nine, but was eager and got there early anyway. Turned from Colonial onto Clifton Street at the CASH LOANS ON VEHICLES place and drove back past the DEAD END sign to Progressive's parking lot. No one was there. So I strolled around the area, looking at the tractor trailers parked across the street and the painting contractor company behind the building. Kerry Richter's sister Renee opened the office a few mintues later. Eduardo Castresana, the chief engineer, arrived next, then Wayne Richter, Kerry's father. Kerry himself arrived a minute or so later, and then his brother Mark. Kerry's wife Michelle wasn't coming in today, nor was his mother, Anita. Angel Rivera and Page Lynette, the VP, got there later, after Kerry and I had headed out to Sheets Airport, about 20 miles west, to go flying. We stopped for gas on the way out of town--two 10 gallon cans of hi-test car gas for the airplane. Sheets Airport (FA42) is a pretty little grass field with two runways and a lot of ultralights and hang gliders, and a few light airplanes. There were three SeaReys tied down in a row. Kerry drove up beside the factory SeaRey and we made it ready to fly. Poured 5 gallons in on top of the 7 or 8 that were already in the tank--plenty, he said, for today's flying. He greased the tailwheel bearing and showed me the preflight routine. He got in the right seat, I in the left, and we made ready to go. The engine is a Rotax 914 like mine. It has a choke, rather than a primer, but Kerry said that the weather was too warm to need the choke. (It was then about 78.) There's no mixture control or carb heat. So the routine was merely master switch on, fuel pump on, throttle cracked open a bit, and turn the key. ROOOOOM, the 914 started right up and was at 2000 rpm almost immediately, running smoothly and quietly. We taxied to the downwind end of the runway and ran the engine up to 3000 rpm to check the magnetos. Full nose-up trim. Twenty degrees of flaps. Then it was time to roll. So I opened the throttle and we rolled. Push forward a bit to raise the tailwheel and rotate at 50 mph--what could be simpler! Climb at 65 or 70. Ten degrees of flaps. Trim down to about neutral. Flaps up the rest of the way--although it seems to fly just fine with ten degrees. I only tried to land on land with the landing gear up once. "Have you gone through your checklist?" Kerry asked on downwind. "Oops. Not yet. Okay, GIFT--Gear is up, Instrument scan looks good, Flaps ten degrees, Trim is as needed." GIFT, I should say, was Kerry's suggestion for a mnemonic. I'm going to think of a better one--and you already know why by now. "Are you satisfied with everything?" "How about your landing gear?" Kerry said. "Look at the gear." I'd forgotten the mantra that amphibian pilots are all supposed to know in their hearts: This is a LAND landing, so the landing gear is DOWN. Later I asked him what I should be thinking about tonight. "Aim at the ground." By which he meant to suggest that I'd been flying too many Cessnas and was trying to land the SeaRey with the wheels a yard up in the air. Tomorrow I aim at the ground. Today there were a lot of thermals, which was probably good because it made the flying harder. Paige Lynette was the instructor today--a very different sort of guy than Kerry, so that was instructive in itself. I mainly just flew around a lot, getting the feel of the airplane, and then did a bunch of land landings, trying to get used to the retractible gear (no screw-ups today), the steep glide angle, and to flying the airplane lower than you can do in a Cessna more than once. You sit so low in these things--about the height of a classroom chair, but sort of semi-reclining, with your legs straight out in front of you--that on landing it looks like you'll plow a furrow for sure. But you don't. If you flare at Cessna height you'll either bounce or land with a great plop. We stopped for iced tea at the Tiki Bar on Lake Minneola, but Paige did that landing on the lake and taxied up on the beach. (Got stuck temporarily on the way out, though.) The really cool thing about stopping there was that nobody even seemed to notice that two guys taxied a seaplane up on the beach and came in for iced tea. Ho-hum. Paige did another landing at the airfield that was also instructive. As I was throttling back on downwind--well, it didn't throttle back. We discovered later that a throttle return spring had departed the airplane--evidently wore out and broke off--so we were stuck with cruise rpm or nothing. We were right over the field so he had me turn off the ignition and he did a lovely dead stick landing, slipping hard to get down. Then we re-started the engine and taxied to the ramp, where he borrowed a spring from another of their airplanes and we went back up. Very useful demonstration. Day Three of Don's SeaRey Training. This was a Kerry day, and that was fine with me, as he and I think a lot alike, so his approach to teaching suits me well. He's less interested in perfecting one thing at a time than Paige is and encourages me to fly MY way, as long as it's safe in the SeaRey and for the conditions. So I'm more relaxed than when trying to do the little things to Paige's specifications. But Paige said something later today that I really liked. We were talking about teaching--my positive feedback theory--and I said I didn't know whether it worked in an endeavor like flying, where not paying attention to a student's mistakes could be fatal. "Yeah," Paige said, "but you don't want to remind them of their mistakes. If you do, they'll learn to do 'em all the more." The guy's a genius. He's a task-oriented guy. This afternoon, for example, he was fabricating about a dozen new hull jacks--a gizmo he invented the other day to lift the weight of the airplane off the main wheels to permit raising of the landing gear on land. That's useful now and then to make sure that they're retracting correctly. The new jacks are smaller and lighter than the one he developed a few years ago, and they work with a nifty overcenter lock that provides lots of lifting force without much effort and then locks the jack in the up position. It's a lot like the SeaRey's landing gear overcenter lock, which does more or less the same thing. Anyway, there he was today, making up a dozen or so and apparently not being bored by the repetitious work. Kerry probably would have made one or two just for the fun of it and then gotten interested in something else. They're both smart guys, but in very different ways, and they make a good team. So how did the flying go today (you ask)? I did about 10 or 15 water landings today and seemed to be getting the hang of it reasonably well. I was overcontrolling at first, but have been getting smoother every day--less spastic, anyway--and today I was really beginning to feel that I was flying the airplane, rather than the other way around. After a while I got to landing without bouncing, usually, and to flying tight patterns without undue risk, skidding, and so on. Dan Nickens flew over Lake Mineola in his SeaRey while we were there, and we chatted with him on the radio for a while. We arranged to meet for dinner tonight, but he phoned the motel later and postponed it to tomorrow evening. But on the phone he said that he saw only one white streak when I was landing--meaning that I wasn't bouncing--so I guess that's a good sign. I ate too much for dinner--pot roast at an Ihop in the motel--and that on top of huevos rancheros for lunch at a terrific Mexican restaurant Kerry introduced me to. Went for a long walk after dinner, but I'm still too full, and I'll probably regret it all night. But I'll be ready to go flying again in the morning. The weather here is perfect, by the way. Per-fect. Perfect. Mostly sunny, mid-eighties during the day and sixties at night. And that's the SeaRey report for tonight. This was a somewhat less heartening day of flying for me than yesterday, which really was quite a good one. Today I got up feeling logy and was behind the airplane every minute, so not much went very well. The weather had turned sour during the night, and we had a strong west wind--about 15 on the ground, but more like 40 just a few hundred feet up. That made things worse, but it was mainly just not a good day IN ME, and I still feel slow and stupid--heavy, as if someone were sitting on my shoulders. We quit after 45 minutes of me being behind. Planning to eat a lot less tonight than last night and to go to bed earlier. And to drink a lot of coffee tomorrow morning. If the weather is okay, we'll go flying in the morning or early afternoon, and then I'll probably head north later in the day--try to get to somewhere near Jacksonville, FL, by dark and then the rest of the way home on Saturday. By the looks of the weather map, I might almost expect to run into snow on the way. The Weather Channel fright mongers are chattering about "FEET of lake effect snow" in PA and NY. This was Day 5 of SeaRey training. And I'm pleased to say that it was a fine day indeed. I made myself a double-strength mug of instant coffee in my motel room and on the way to the Progressive Aerodyne office filled up the gas tank and bought a Hershey bar. At the office I had two more cups of coffee. By the time Kerry and I got to the airfield, about 26 miles to to the west, I was wide awake. We fired up the Rotax 914 and took off. Flew to a nearby private airport and did three landings, then came back to Sheets field for another four landings. They went well, so we took off again and flew to a nearby lake, where I did something like 15 landings--with 20 degrees of flaps (normal), with 10 degrees of flaps; with power on and with power off. I tried all the combinations and permutations there were. Made increasingly tight patterns as I got more comfortable with the airplane, until I was flying the whole pattern in an area about the size of a K-Mart parking lot. The normal approach, by the way, is with 20 degrees and at 70-80 mph. (80 is the top of the white arc.) Throttle as needed. It's a draggy airplane, though, so you really do aim the thing at the ground. It's light, so you have to keep your speed up until almost on the ground, then flare at an altitude that at first looks like you'll be plowing a furrow and hold it off until it lands. The procedure is esentially the same on water, except that you don't three-point it and instead have to finesse it a bit just before it touches the water. And of course, you leave the gear up. Take off is with 20 degrees and full nose up trim. With the Rotax 914 and two aboard, it gets off the grass or the water in about 300 feet (if you do it right). Initial climb is at 65 with 20 degrees. Kerry likes to ease the throttle back a bit while still lower than I used to think wise, but I learned to do it comfortably today. Throttle back from full takeoff power--5800 rpm--to about 5500, go to 10 degrees of flap and let the speed ease up to 70. You can fly all day with 10 degrees if you want to. But the better thing is to go to 0 degrees and trim down to about neutral, with the rpm at 5000. Then you let the stick ease forward just a bit so you're descending slightly. That lets the speed come up past a kind of threshold, and all of a sudden you're flying 10 mph faster than before, the nose comes back up to level, and you have to throttle back to 5000 again. You're going 10 mph faster and burning less fuel. That airplane has manual flaps, but with the electric flaps, Kerry said, I should be able to reflex them a few degrees and get even better speed for the power. Speeds: 115 is Vne. 80 is Vfe. 90 is Va. At 5000 rpm, cruise is about 100 mph, but Kerry likes to cruise at about 90 or 95. At 4600 rpm he says it burns about 3.5 gph and at 5000, about 4.5. After a LOT of water landings we raised Dan and Paige on the radio. They were flying two SeaReys north from Sebring, from the Rotax engine dealer there, where one of the airplanes had undergone an engine overhaul. 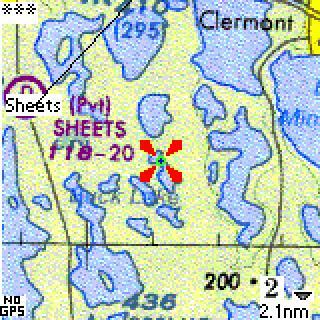 We all decided to have lunch at the Tiki Bar, on Lake Minneola, about 20 miles to the northeast, so I pointed us in that direction, staying relatively low--about 800 feet--to keep out of the NNE wind. On the way we passed a large soaring bird that was making good speed, despite the wind. It had a white head, and Kerry identified it as a bald eagle. At Lake Minneola, I landed and Kerry showed me how to taxi up onto the soft sand beach. Throttle to idle and slow to displacement mode. Lower the landing gear. Throttle up a bit and approach the shore at about a 45 degree angle. When the wheels find the bottom, throttle up enough to keep moving, and KEEP moving until out of the water and past the soft sand. Kick in some rudder to swing the nose back around to pointing maybe 20 or 30 degrees offshore so you can later start taxiing down the beach and into the water. After lunch we strolled down to the beach, hopped into the three SeaReys, taxied out into the lake, raised the wheels, and took off. How cool! We flew back to Sheets airport and landed one last time. I hated for it to be over. What fun it is, flying those things. Kerry said I'm good enough now to keep from killing myself.